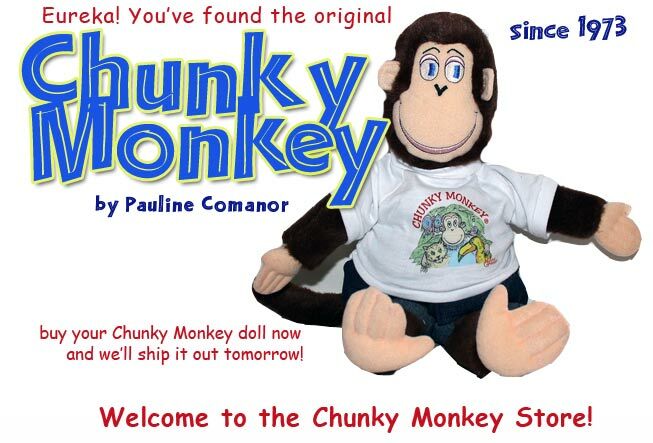 Your one-stop shop for Chunky Monkey dolls and gear, most of which can only be found here! We accept Mastercard, Visa, American Express, Discover and Paypal. You can make online purchases easily here, and your order will be shipped out the next day. We ship by U.S. Postal Service first-class mail and charge a flat-rate shipping cost of $6.95 for your entire order when shipped anywhere in the Continental U.S.
Who we are: We are Chunky Monkey LLC, a really, really small company in New Jersey founded by Chunky Monkey's creator, cartoonist Pauline Comanor. Where you are: You've magically landed at the exact right place to find a whole bunch of unique and authentic Chunky Monkey branded items based on Pauline's original creation. To learn more about Pauline Comanor click here. Thanks for stopping by, now start shopping. International Shipments: We ship worldwide and will refund any over-shipment costs to you after mailing.